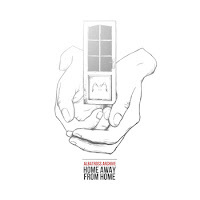 Cardiff band Albatross Archive's EP home away from home has some really interesting touches like the flute on the track "Sodium", that keep this album from being your run of the mill acoustic release. The vocal interplay on the opening track "One By One" is inventive stuff. Lead singer Richard Jackson has some jazz influence singing on "King Of Hearts" that is pretty interesting. You can hear ite a few style being thrown in the mix on this album and they work very well. Thanks to Richard and the band for the free download! Thanks again to DC at The Waiting Room Radio Show for the tip.